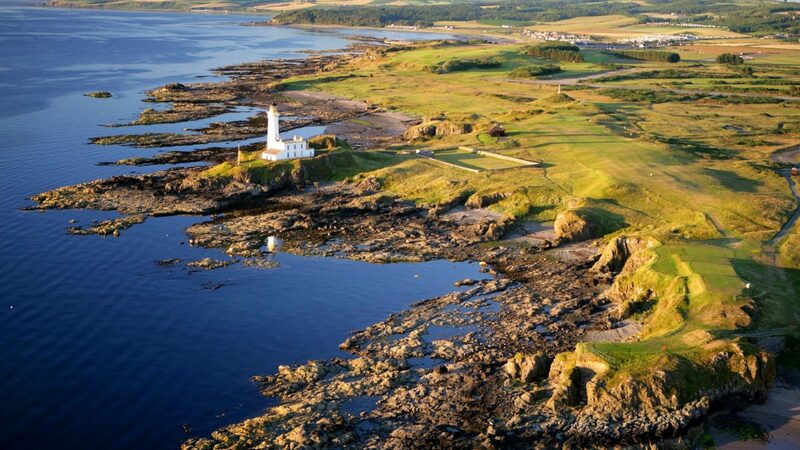 Scotland’s east coast is absolutely the most popular golfing region. The courses are clustered together so you spend more time playing golf and relaxing afterward and less travel time. Based in our preferred resorts in St. Andrews you can easily play Carnoustie, Kingsbarns and all the St. Andrews Courses, including the Old and New. Enjoy a relaxing afternoon in and around St. Andrews or at the resort. Stop at Falkland Palace and Gardens, connected with Scottish kings since the 14th century. See Holy Trinity Church, St. Andrews Cathedral and Priory, founded in 1160 and the Castle of St. Andrews dating back to the 13th century. The Kittocks Course was designed by Bruce Devlin and boasts spectacular views over the North Sea, along the rugged Scottish coastline and the unmistakable skyline of the medieval town of St. Andrews. The final stretch of holes represents one of the most exacting finishes anywhere in Scotland. Alternatively choose St Andrews New course. Golf on St Andrews Castle Course which is set on a rugged cliffline overlooking the ancient town of St Andrews, the course combines breathtaking views with a memorable golfing challenge. Designed by David Kidd, The Castle Course was included within the prestigious Golf Digest Top 100 rankings almost immediately after opening. The course was opened for play in 2008. Play on St. Andrews Old Course, long considered the home of golf. All the Greats have competed on this hallowed turf, where golf has been played for over 400 years. It is every golfers dream to stand on the first tee at St. Andrews Old Course. The Old Course dates back to the 16th century. Golf at Kingsbarns, located directly on the North Sea coast only six miles from St. Andrews, Kingsbarns is without a doubt one of the most breathtaking links courses ever developed. The significance of the development was highlighted by Sir Michael Bonallack, winner of five British Amateur Titles and captain of the R & A when he indicated that “Kingsbarns might well be one of the last true seaside links sites capable of development in Scotland”. The links boasts spacious fairways, which roll and twist through majestic dune ridges and hollows, as sea figures prominently on every hole. Play Carnoustie, thought Walter Hagen, is the greatest course in the British Isles and one having the toughest finish in golf. The unfriendly burns, the relentless winds, and the sheer length of the course test the abilities of all golfers. Carnoustie was founded in 1842. Golf on the Torrance Course at the Fairmont St Andrews. Opened in 2001 and designed by former Ryder Cup captain Sam Torrance, the Torrance Course offers Scottish style links golf at its very best. The course features revetted bunkers, dry stone walling and cliff top putting greens. The panorama from the course is quite simply astounding, with views over St. Andrews Bay to Carnoustie and the Grampian Mountains. Depart Scotland and transfer to Edinburgh Airport to board your flight back home. Fairmont St Andrews is located on the outskirts of St.Andrews on the road to Crail. Sitting on the summit of a spectacular cliff formation, the hotel and its two championship golf courses have breathtaking panoramic views of the River Tay estuary, the North Sea, the Fife countryside and the medieval skyline of St Andrews. This international resort opened in the spring of 2001providing those seeking modernize amenities and an excellent standard of service. Edinburgh Airport is located approximately 60 minute a drive from the resort. Nearby golf courses include; St. Andrews Old Course (1 minute), Kingsbarns (25 minutes), Carnoustie (55 minutes), Gleneagles (70 minutes), Muirfield (1 hour, 45 minutes), Gullane (1 hour, 45 minutes), North Berwick (1 hour, 50 minutes). Scotland golf packages are fully customizable!